Today is the Autumnal Equinox, the first day of fall in the northern hemisphere. 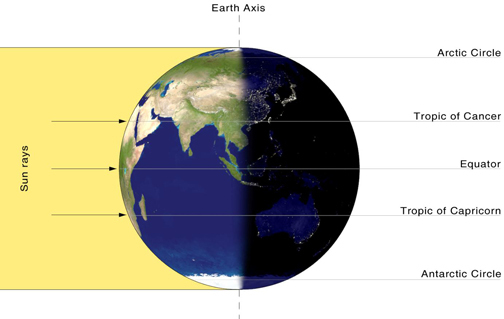 The new season officially arrives at 20:44 UTC (4:44 PM EDT) when the sun is directly in line with the Earth’s equator. Seasons are the result of the tilt of the Earth’s axis, a 23.5° angle. Today, as autumn begins, the planet’s axis is tilted neither toward nor away from the sun. As a result, we receive approximately equal hours of day and night. Derived from Latin, the word “equinox” literally means “equal night”. As a transitional season, autumn is a time when the heat of summer fades away and the chill of winter gradually returns. The largest drop in average temperature, however, usually lags the equinox by a few weeks. The angle of the sun’s rays hitting the Earth on the Autumnal Equinox. This entry was posted in weather and tagged autumn, seasons, space by Melissa Fleming. Bookmark the permalink.